The film discusses the plight of a coastal Canadian hamlet whose dried up fishing industry has left the town folk down and out. A plan to bring in a factory is in the works, but a full time doctor is needed on the island otherwise it’s no deal; the conflict: no big city (Montreal?) practitioners are willing to make the move to a quaint fishing village (I am running out of synonyms for small town at this point). In a desperate bid to bring a factory to the town, the de facto mayor, Germain Lessage (Raymond Bouchard), strings together a plot to entice a big city plastic surgeon (David Boutin) into staying longer than his forced one month stay. There are a few missing details, but the premise is what it is, some small town big/city humor. At stake, the future of the town. The film itself is hilarious. After the residents learn that the doctor loves cricket, they stage a hilarious half-baked match for his benefit. The whole film revolves around the townspeople catering to the doctor’s every wish, going so far as to tap his phone and listen in, sometimes catching scandalous calls to his girlfriend. The comic timing of the actors in the film, especially Bouchard and the actor who plays his brother-in-law, Pierre Collin, is really great. If your looking for an analogy for the type of humor found in this film, I would say it’s close to Hot Fuzz (2008); come to think of it, the plot is similar to The Englishman Who Went Up a Hill But Came Down a Mountain but luckily for us there is no Hugh Grant to be found. I don’t think I stopped laughing for most of the film, so this is a good pick if you’re in the mood for something light. As with most foreign language films, do watch the subtitles and avoid dubbing, as the delivery in French adds to the humor of many of the jokes. note: This film played at the Chicago Cultural Center, which was a great place to see a film. I failed to take a picture of the theater, but I will do so next time I go there. All of the times are listed on their website and there is no charge for any of the films. 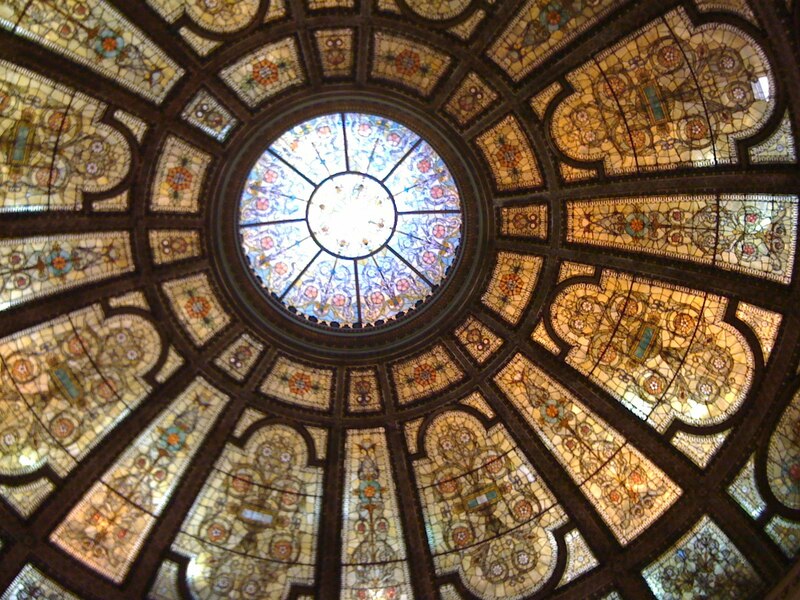 Oh, and here is a random picture of the beautiful stained glass dome outside of the theater.